Thread: Mind is the cause for bandhan and moksh !! Re: Mind is the cause for bandhan and moksh !! is the final seer behind all that we see and perceive. Where did I get that idea from? Its recovery/’meeting with’ (lambha) brahman is only dwelling within (aysa) one’s own SELF (svātman); it is not (na) observed (darśanaṁ) like a jar (ghaṭavan). netravad = netra + vat or eye + like ( ~ like the eye~); the beauty of this term ‘netra’ is it also means a guide. The alignment here is the eye is the ‘guiding’ organ. I am still perplexed by the use ‘yevopa’ which can be a case ending (ye) + vopa ( which is vu+opa) ; I lack a reasonable translation for it. spandapradīpikā = spanda + pra + dīpa + kā or offering fulfilling (pra) & satisfying (kā) light (dīpa) on spanda. I do not possess a copy of this work; I just find various couplets ( verses) quoted here and there. utpala+bhaṭṭa - bhaṭṭa is a title of respect , the ‘venerable’ utpala. There is also the other utpaladevācārya I have mentioned in the last post above: utpala+deva+ācārya utpala = blossoming, any flower + deva = divine, of highest excellence + ācārya is the master, knowing or teaching the ācāra or rules, the spiritual guide & luminary within kaśmir śaivism. Last edited by yajvan; 06 August 2016 at 06:22 PM. The mind is the slayer of the Real ( i.e. of SELF, of pure awareness); when the slayer is slain, then the Real reveals itSELF. Recall from the post above, These methods are all to bring about śuddha-vijñāna-kevalatā - isolating (kevalatā) pure (śuddha) awareness (vijñāna) for the sādhu-s re-recognition ( ~realization~); that is, the unfoldment of this (śuddhavijñāna) so it can be stabilized and nurtured into god consciousness. So, this 'slaying' is done (evidently) by being without the 3 guna-s. Let’s make sense of this & connect kṛṣṇa-ji’s instructions to ‘unminding’ the mind and this puryaṣtaka ( city of 8) idea. If one inspects a listing of tattva-s of everything that makes up creation it starts with śiva and ends with pṛthvī or earth ( code for full material existence); śiva is pure Being, existence itself ( the canvas) and all the tattva-s are the ~ elements~ ( really ‘that-ness’) that appear on this canvas to form the picture of creation. In the kaśmir śaivism school of thought there are 36 of these elements. In other schools there may be 25. I will not bore you by listing them out as these can be found in most any book or google search on ‘tattva’. The logic is that each succeeding tattva contains the previous tattva in it. Well of you follow the audit trail of these tattva-s you will come to the tattva of prakṛti ( some like to call this ~ nature~). The next tattva above this are the antaḥ (internal) + organs (karaṇa-s). It is via the 3 guna-s that prakṛti does its ‘nature’ of making , performing , manufacturing , composing all that we see in nature. And one of those products is antaḥ (internal) + organs (karaṇa-s). If one is without the 3 guna-s per kṛṣṇa-ji’s instructions, they are ~beyond~ that which enables the antaḥ (internal) + organs (karaṇa-s) to function incessantly – with our without our permission they continue to fluctuate ( to shift back and forth) incessantly. Why? That’s just what they do! So you ‘slay the mind’ by transcending the antaḥ (internal) + organs (karaṇa-s). And where does one arrive? Possessed of ( or established in) the SELF (ātmavān). And what do we do to accomplish this ? Find the upāyaḥ that brings about śuddha-vijñāna-kevalatā - isolating (kevalatā) pure (śuddha) awareness (vijñāna). This pure awareness is non-different than svātman one’s own Self. Now some get a little nervous when they hear 'be without the 3 guna-s'; you see, if you are possessed of the Self (svātman) it means your frame of reference is Self-referral. You are aligned to SELF , you do not identify with all those thought-fluctuations being dragged here and there. Note what I say here: You are aligned to SELF means 'You' and 'SELF' are non-different. There is no 2! The 'you' that many are engaged in as you read this post is ahaṁkāra, part of the antaḥ (internal) + organs (karaṇa-s) that fluctuate, that is the limited 'you'. That one minute you are happy, then sad, then aggressive then non-aggressive; one moment you are filled the the thoughts of the divine and the next you are filled with mischief. Something that fluctuates that much cannot be considered 'real and stable'. The 'real' never fluctuates and that is this Self (svātman). And what is the nature of this svātman? We hear over-and-over again from the saints and muni's of this expansiveness, of the joy that comes with the territory. My teacher always mentioned a key quality - wholeness, fullness, one is always at home. 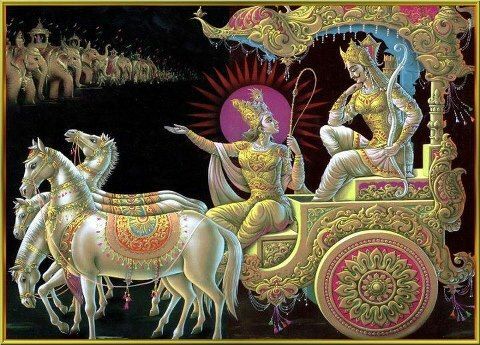 Your body becomes the chariot and 'you' Self are the passenger of the chariot. The chariot is well managed by creation - it functions properly as one still eats, breathes, walks ,talks and the like. All the laws of nature still function, yet 'you' are in harmony with all these laws. How could one not have the time for this? How could one wait till another life to pursue this? I saw your reply to my question.. I am really thankful that you write and illustrate much things.. Also you offered much posts which are beneficial for readers.. I always tend to give much time to understand your posts as they are intellectually high.. I just window read now.. When I will study your posts I will ask you if I have any query.. Here also the vishnu dutas instructed ajamila to do manasik bhakti and not with the senses. I will do kirtan,dhyaan etc through my mind. recollect that point from where your mind has been deviated,now the mind will become firm and you can continue doing dhyaan again. The purpose of meditation is to bring the mind to the state of thoughtless awareness. Japa and visualization of your favourite deity are but one of several means to slow down the incessant thought flow in the mind and bring it to the point of stillness. This prepares the foundation for meditation or thoughtless awareness. Same goes for pranayama as well. Visualization works for some, while japa works for others , while some use both. So let us not say this is better than that and so on, but go to the level of the spiritual aspirant and prescribe him or her a technique which is suitable for her samskaras and temperament. A shaivite would be more comfortable with a mantra japa on Shiva, whom he had been worshipping all his life than a mantra on Krishna or his visualization. Similarly a Shakta would prefer a mantra on Devi rather than Krishna or his visualization. The appropriate paths for each seeker prescribed as per his temperament and inclination will enable him to reach the goal at the earliest. @ajayji -- As you say it's not the same for anybody,had all kinds of sadhanas have been giving the same result,why does the padma purana says that dhyaan is the essence of all the shastras and also note that as the bhagavad gita says -- Whatever one thinks of and then quits his body,he gets a body accordingly as he thinks or remembers when he quits his body.So it's understood that the next body which we take depends on the mind only,and dhyaan is the only sadhan which is done through mind,so mantra or doing pooja is not the ultimate,as all these are done with the senses and not with the mind. Raksha Bandhan 2011 - Don't forget Sister!! !